Check us out on our LinkedIn page. We do not have any upcoming Louisiana Chapter events listed right now. Please email the Louisiana Representative to let us know about any local, regional, or state GIS events in Louisiana that you have planned. 2019 Louisiana RS/GIS Workshop - 19–20 March in Lafayette. Louisiana Remote Sensing GIS Workshop - Louisiana's annual workshop of remote sensing and GIS professionals. 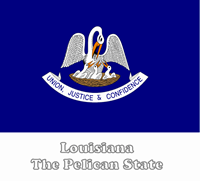 Louisiana URISA - The Louisiana Chapter of Urban and Regional Information Systems Association. Southwest Division of the Association of American Geographers - The regional division of the American Association of Geographers (AAG) that represents AAG members residing in Arkansas, Louisiana, New Mexico, Oklahoma, and Texas.